I know it doesn't look like much, but all the stitching is done on this heart. I just need to add the beads which really makes these hearts sparkle. But that will have to wait as I need to work on the project for my guild, the doodle drawn thread sampler and the next crazy quilt block that has come may way. I do love this white work piece. I just don't think I am doing the greatest job at it. But since this is just the doodle sampler and there is another larger sampler ahead of me,I try to keep plugging along. I am also anxious to start one of my Scarlet Letter samplers, but have too many things in my rotation right now. How does Linda keep up with all her new starts? I would go crazy! Or crazier than I already am! I continue to work on this piece off and on. I try to get 12 stitches in a day, but that doesn't always happen. It is really close to putting the beads in but I have so many other priorities right now. Anyone else in the same boat? I figure if I get the pilot class stitched, I will be able to finish some other projects up. I haven't made much progress, but I am making some. 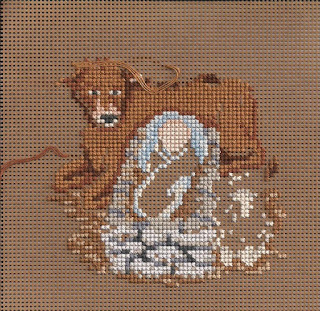 Hopefully I will have some time this week to get the stitching finished on this piece so I can get to the beads. We had a good snow on Valentine's Day so I took the opportunity to dye some fabric. Not sure I like all of it, but some of the pieces are fabulous! I did my first row of drawn thread on my doodle sampler. It was fun. I still have to do some pulled stitches around my squares and of course, I did have miscounted, but I don't think anyone will notice in the long run. I need to go stitch on my pilot piece that I am doing for ANG.It is lots of fun and I wish I could show you photos. I gave myself permission to work on my heart yesterday and I thought I was zooming along. And I was....incorrectly!!! I probably should have left it alone and stitched the right side like the incorrect left side, but I removed the stitches. Now I have holes in my canvas where there shouldn't be(congress cloth is very unforgiving) and I have more stitches to take out. Sigh. I think it will be fine no matter what and my mother has offered to take it off my hands when I am done. Here is my large project. It is Gay Ann Roger's Drawn Thread Sampler. This is the doodle or practice one. I hope to do both. The plan is to cut threads on this today. Makes me nervous! Thanks for your comments. They made me laugh as I can tell you are all dedicated stitchers and love new projects as much as I do. But I really need to make a dent in my stash before I add more. is having a sale starting on Thursday. I think she will have at least one new heart that I will have to add to my stash. So much for will power and self-control. The other day a friend asked about projects and starting new ones. It made me think about the projects I am currently working on. First, there is the year long project I am teaching my local EGA. Next is my large project which right now is Doodle Drawn Thread Sampler by Gay Ann Rogers. Then I have a small project to work on which is usually a Mill Hill bead kit or one of those Stitch N Zip Projects. And I usually have a medium easy project going which currently is this Cameo Blue Heart by Gay Ann Rogers. When I finish one of these projects, I start a new one(either a WIP or a totally new project) in the same category. So when this heart is done, I will start a new one or work on a Santa by Janet Zickler Casey. How about you? How do you decide to start a new project? I finished working on my section of this crazy quilt. The dragonfly came out ok. I would fix him, but I am not sure how. His body isn't as pink as it looks on my screen. It needs to be shipped out next week and then I receive someones square. Fun! It has been a bit since I posted. My dd is taking driver's ed and it is taking a lot of my time too! I gave up starting more pieces although I will be starting at least two, maybe three more projects this month. But all those starts were getting to me. I can't imagine starting a new one each day for a year! 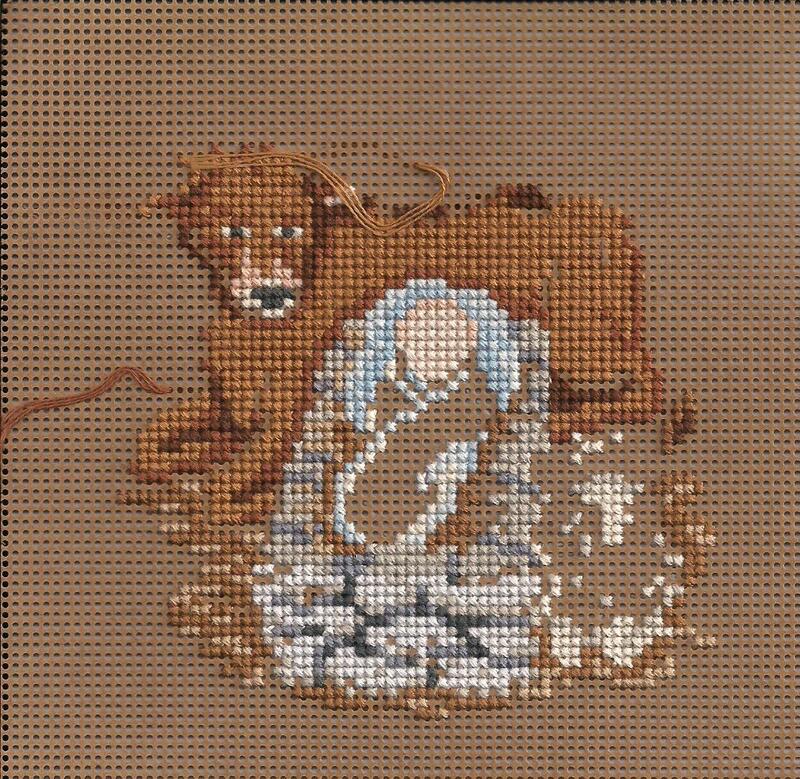 I am trying to finish this Mill Hill bead kit. I work on it a little every evening. Tomorrow I will show you a finish,kind of.